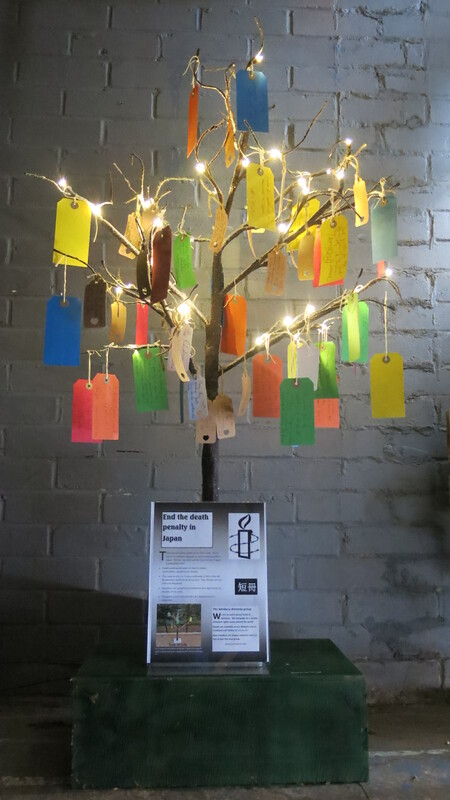 We held our tree of life signing in Library passage this morning (1 September 2018) and collected over 40 signatures. People were asked to sign small labels which we attached to a small tree to mimic the Japanese custom. There were several people who were surprised that the methods the Japanese employ – solitary confinement, decades of incarceration and no notice of the execution itself – were still employed by a supposedly civilised country. All the labels will be gathered up and sent to Amnesty for a combined presentation to the embassy in October. Our thanks to all those who signed and to group members who spent time on the stand. If you would like to join the local group, keep and eye on this site or on Twitter or Facebook (accessed on the left) and make yourself known at one of our activities. Every month, the group publishes a brief report on the death penalty around the world. See the latest edition here.